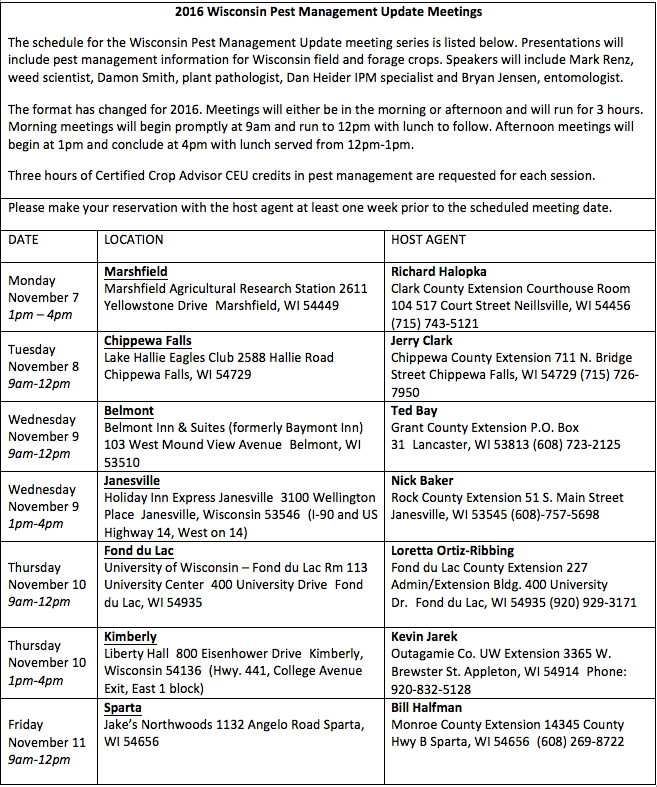 Mark your calendars as the UW Extension’s Pest Management Update meetings are just around the corner (November 7-11). The format has changed for 2016. Meetings will either be in the morning or afternoon and will run for 3 hours. Morning meetings will begin promptly at 9am and run to 12pm with lunch to follow. Afternoon meetings will begin at 1pm and conclude at 4pm with lunch served from 12pm-1pm. The new format will include presentations by Bryan Jensen with UW-Madison Entomology, Dan Heider with the UW Integrated Pest and Crop Management Program, Damon Smith with UW-Madison Plant Pathology, and weed scientist, Mark Renz with UW-Madison Agronomy. The focus of the first 2 hours has been changed with more emphasis on research updates and important highlights from the 2016 field season. The second session will be an interactive diagnostic troubleshooting exercise based on issues observed in the 2016 field season. In addition to a new format, a packet of information will be supplied to all registered participants. 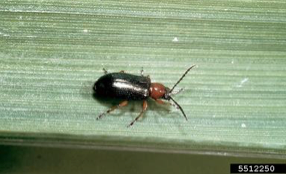 The packet will include the usual handouts and also a copy of the 2017 Pest Management in Wisconsin Field crops (A3646) guide. We also will include in the packet one copy each of “A Farmer’s Guide to Soybean Diseases” and “A Farmer’s Guide to Corn Diseases”. This two volume set is a $60 value! The full schedule with dates, meeting locations, topics and registration contact information are highlighted below. Please register with the host agent at least 1 week prior to the meeting at the location you wish to attend. Be sure to look at the 2016 schedule included with this article when selecting your preferred date and location. Registration fees at each location may vary, but will be around $50 which will include access to the packets, refreshments, 3 hours of CEU credit, and great information!